Yes great day out there Shad Love your new, top secret kingi weapon. Good on you doing the R&D while we were sleeping at the wheel!!!!!!! After several of your hook ups I called out on the radio: "what is this guy doing that I cant?" Come to think I have read somewhere that this is the rig some of the top yak hunters are using in South Africa for trolling for pelagics. OK I found the article but note that these guys were using doubles instead of trebles? What to you recon is better? Braid or mono? Herb what I was doing right was getting my rod tip to vibrate, telling me that the Chinese made lure that you gave me was tracking right. Every lure has got a sweet spot. There are currently lots of snapper off the port. I got a bin full in 30m with a few gurnard and KW to top it off. Hi all, just to flag with ya'll in the Naki our Eastern BOP annual kayak fishing comp will be held later in the year for 2019. The date set down is Saturday the 4th May as usual with the briefing the night before at the Whakatane Sports Fishing Club. The reason for the later date for the comp is a better chance of settled weather and the fishing is way better. This will be our 10th comp and we are looking at making it the best ever with input from all our main sponsors. Details of categories and prizes will be out soon. 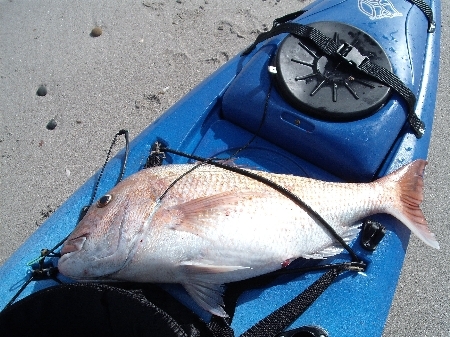 A new section for the biggest snapper over 60cm (catch & release) will be included. Three of the old fart brigade paddled out to 80m and got 4 good albies around 70m. Okuma gear performed faultlessly as always. Apart from the shirt and cap I got when I sent them some photos, otherwise No! However, because of the reasonable price and good quality I have used their gear for a long time, which is an important issue for a pensioner like myself. To be honest I don't even buy their best rods and am happy to use the X-Factor rods for both sea fish and trout. The only ones I ever broke where two when I accidentally backed my car over them. Cheap as and good enough for me to swear by them. For me gear only plays a minor part in fishing, in contrast to the saying "All the gear and no idea." Staying with the low cost gear theme. Last year I imported 67 bibbed hard bodied Rapala type lures for tuna trolling from China for under NZ $100. Some hooks are crap but otherwise the tuna love them. Why pay $15 -30 for something similar locally??? At that price I don't worry if a mako or blue bites one off. Oh yeah those Xfactor rods are great. I just bought 2x Shimano Sienna reels $54 each so I know about cheap 😉 and they are decent reels. Good on ya Rainbow - great way to get the season underway. Wow, first time I've popped my head into here in ages. What a cool forum. Top effort and fish Herb! Great for your health and fitness getting out Kayak fishing like you do You probably don't remember me but 38 years ago you were my Boss On Egmont National Park. I was Doing tracks and Hut Maintenance for a year or so. Hi Geoff Unfortunately I do not know who SG is but you are not the only one who tells me they worked in the park. With the help of a very smart lady in the labour Department I took on up to 50 troubled unemployed youths at a time and with their help repaired tracks, built bridges and renewed most of the huts. While at first I only looked at them as cheap labour after a while I realised what this work in the wonderful park did for them and helped them turn their lives around. After six months they were fit could organise themselves learned how to work as a teem and became job ready. Even now after all those years I occasionally run into some grown man who tells me what you did and how it sorted him out. I recently met with the new minister of labour and told him about this scheme for the DOC estate, which would help many troubled unemployed youths. lets hope he takes it up because like you I know it worked. Thanks for the help getting me up to speed with all the radio jargon yesterday morning. Went out to 60m before I turned back as that wind showed no sign of dropping so had to keep some energy for the paddle home, lots of kingfish sign around saddleback though but they weren't interested in a live kahawai or the 5 lure options I had. Adding an upgrade this week and had a couple of quesitons if that is ok.
Where did you get the aluminium for the base plate? And forgot already, who to contact about the carbon firbe tubes?